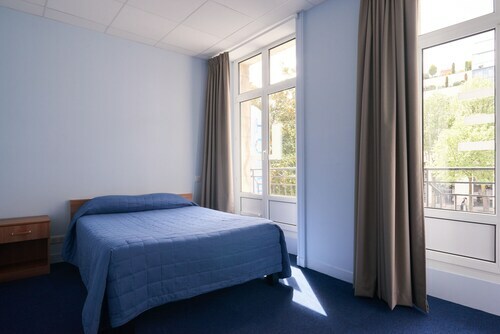 Located in Gréneraie-Clos Toreau, this hotel is 0.8 mi (1.2 km) from Hospital Saint Jacques and 2.3 mi (3.6 km) from Machines of the Isle of Nantes. La Cite Nantes Event Center and Le Lieu Unique are also within 2 mi (3 km). Pirmil Tram Stop is 17 minutes by foot and Reze Pont-Rousseau Station is 29 minutes. 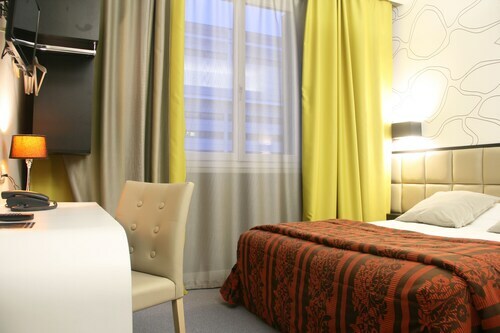 Located in Nantes Centre, this eco-friendly hotel is within 1 mi (2 km) of Passage Pommeraye and Machines of the Isle of Nantes. Theatre Graslin and Cours Cambronne are also within 10 minutes. Commerce Tram Stop is 10 minutes by foot and Nantes Station is 27 minutes. 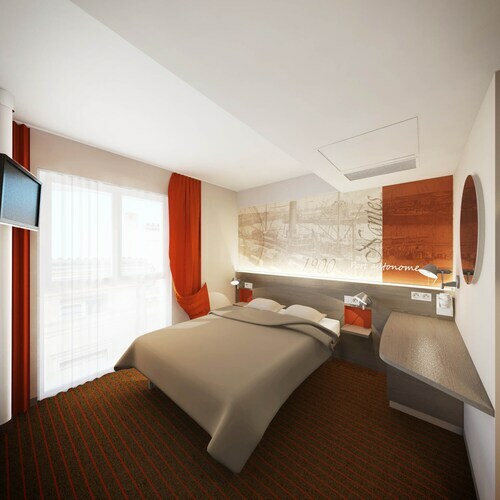 Situated near the airport, this hotel is within 1 mi (2 km) of Zenith de Nantes and Atlantis Shopping Centre. Manoir de la Begraisiere and Saint Hermeland Church are also within 2 mi (3 km). 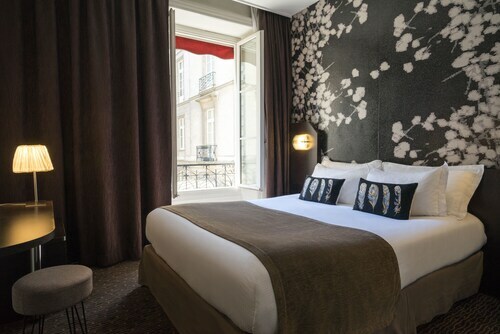 This family-friendly Nantes hotel is located in the historical district, within a 15-minute walk of Passage Pommeraye and Chateau of the Dukes of Brittany. Machines of the Isle of Nantes and La Cite Nantes Event Center are also within 1 mi (2 km). Commerce Tram Stop is 7 minutes by foot and Nantes Station is 24 minutes. 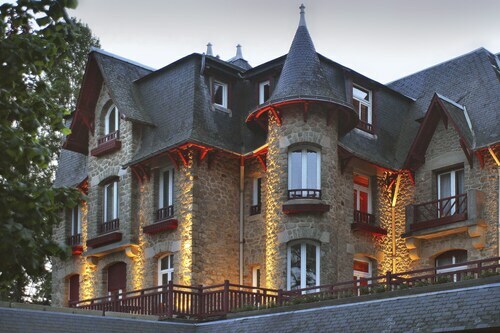 Located in Talensac-Pont Morand, this eco-friendly hotel is 0.3 mi (0.6 km) from Nantes Cathedral and 1.6 mi (2.6 km) from Machines of the Isle of Nantes. Japanese Garden and Ile de Versailles are also within 10 minutes. Commerce Tram Stop is 11 minutes by foot and Nantes Station is 21 minutes. Located in Talensac-Pont Morand, this residence is 0.6 mi (0.9 km) from Ile de Versailles and 1.6 mi (2.6 km) from Machines of the Isle of Nantes. Japanese Garden and Place Royale are also within 15 minutes. Commerce Tram Stop is 15 minutes by foot and Nantes Station is 29 minutes. Located in Malakoff-Saint-Donatien, this hotel is 0.2 mi (0.3 km) from Jardin des Plantes and 1.8 mi (2.9 km) from Machines of the Isle of Nantes. Beaux-Arts Museum and Le Lieu Unique are also within 10 minutes. Nantes Station is 5 minutes by foot and Commerce Tram Stop is 14 minutes. 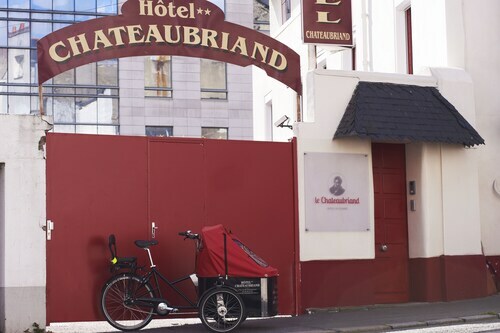 Located in Nantes Centre, this hotel is 0.3 mi (0.4 km) from Place Royale and 1.3 mi (2.1 km) from Machines of the Isle of Nantes. Bouffay Square and Place du Commerce are also within 10 minutes. Commerce Tram Stop is only a 4-minute walk and Nantes Station is 20 minutes. 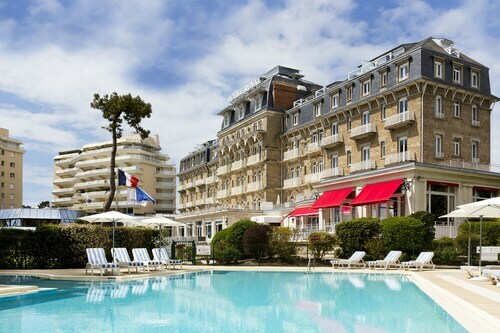 Situated near the beach, this luxury hotel is steps from Casino Barriere de la Baule and La Baule Beach. Notre-Dame de La Baule and Rivage Thalasso & Spa are also within 2 mi (3 km). La Baule Escoublac Station is 22 minutes by foot and Le Pouliguen Station is 30 minutes. 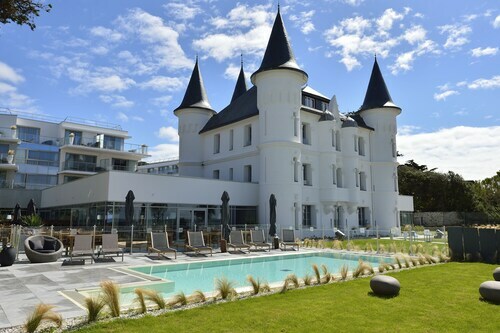 Located in La Baule-Escoublac, this beachfront hotel is in the city center and within a 5-minute walk of La Baule Beach and Casino Barriere de la Baule. Notre-Dame de La Baule and Rivage Thalasso & Spa are also within 2 mi (3 km). La Baule Escoublac Station is 25 minutes by foot and Le Pouliguen Station is 27 minutes. 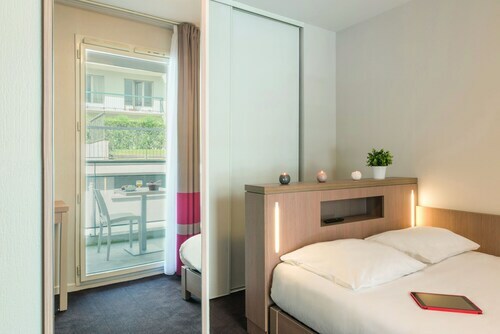 This family-friendly La Baule-Escoublac hotel is located in the entertainment district, within a 5-minute walk of La Baule Beach and Casino Barriere de la Baule. Notre-Dame de La Baule and Rivage Thalasso & Spa are also within 2 mi (3 km). La Baule Escoublac Station is 18 minutes by foot. 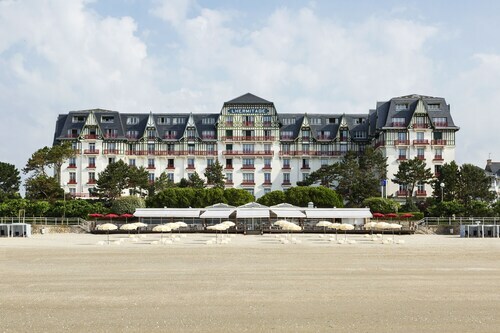 Situated near the bay, this spa hotel is within a 15-minute walk of La Baule Beach and Hippodrome de Pornichet-La Baule. Casino de Pornichet and Notre-Dame de La Baule are also within 6 mi (10 km). Pornichet Station is 23 minutes by foot. How Much is a Hotel Room in Loire-Atlantique? Hotels in Loire-Atlantique start at $42 per night. Prices and availability subject to change. Additional terms may apply. Pack your bags—it’s time to embark on a getaway. Whether you’re craving a solo retreat or promising your family a vacation to remember, book one of the best hotels in Loire-Atlantique. These hotels are located within easy access of the city’s hottest attractions and entertainment, so you won’t miss a beat while you’re in town. Spend the days exploring the local landmarks and the evenings getting to know the nightlife. After exploring the city from top to bottom, rest up at a hotel that speaks to you. Find the perfect place that matches your trip’s vibe, from a trendy boutique to family-friendly accommodations. Allow us here at Travelocity to pair you with up Loire-Atlantique hotels that suit your vacation preferences. Discover places with convenient on-site restaurants, around-the-clock service, and pools where your kids can make a splash. Some hotels may boast fitness rooms and spa services, while others feature game rooms and Wi-Fi access. To top it all off, you’ll score cheap hotels in Loire-Atlantique that let you spend more on your activities and less on your lodging. Book and bundle your flight and hotel deals together today and save up to $537. It’s time to explore a new city, and break out of your routine. 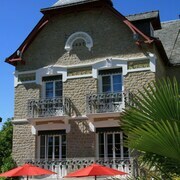 Wonderful boutique hotel in an excellent location. The hotel staff were extremely friendly and helpful. Breakfast was perfect. The beds were the best we’ve had in France. The only negative was we had a fourth-floor room and it had low beams that made it tricky for our family of four adults to get around. Overall, I highly recommend this hotel! The reception is closed between 12 and 2. The room was really subpar without any furniture to speak of, the kitchen oven was missing its window and made a lot of noise that could not be stopped, the mechanical curtains in one of the bedrooms were blocked closed, etc, etc. This is not an expensive place I admit but a large room in a Marriott Courtyard in the US will be a million miles better for the same price. Description sounds like modern and special. It is stark and tiny and bleak. We stayed in a standard room which was very tiny--claustrophobic. we looked at the next size--the mid-level and it was hardly better at all. The highest priced rooms were very expensive. The only good thing about this hotel was the location--right in the middle of the activity in town.